"Unbeaten in nine and then lose 5-0? I'd take that"
There will be no one sounding the alarm bells at Harborough Town despite a dramatic end to their long unbeaten run. The Bees went into last Saturday’s UCL Premier Division game at Deeping Rangers having not lost in nine matches. However, that was stopped with a bump as they fell to a 5-0 loss. 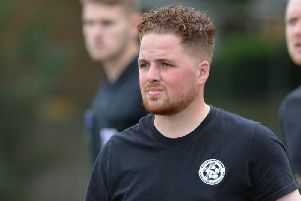 They bounced back in midweek by knocking Melton Town out of the League Cup on penalties, but boss Nick Pollard admits his side were at their lowest on Saturday. “On the day we met a team at the height of their game,” the Harborough boss said. “In contrast we probably put in our worst performance of the season. “There are no excuses. They were better in every department and fully deserved the three points. “I think the problem was that, up until Saturday, we had won eight and drawn one. It had been a long, long time since this side was two down. “It came as a bit of a shock and maybe heads went down a bit. “At some point we were always going to lose – and we’ll lose again. “We are a young side and we’re still learning. “We were beaten by the better side but it didn’t have to be five. We should have kept going and maybe restricted them to two. That’s the most disappointing thing. “Having said that we haven’t become a bad side overnight. “I’m not going to worry too much – it’s a blip. “We’ve lost one match in 11. If you offered me the chance to go nine unbeaten and then lose 5-0 I’d snap your hand off. “And if you offered to me again now, I’d snap your hand off again. The League Cup win on Tuesday night – which booked them a game against Thrapston in the next round – helped to get the Deeping pain out of the system. But it also served a greater purpose as Pollard made six changes to his starting line-up. “It was what we needed. We had to get back to winning ways,” he explained. “We had a good night in many ways. We got through to the next round of the cup, we rested a few players who were carrying injuries and got some minutes into those who needed it. “It also gave us a chance to have a look at some of the reserves and under-18s. We made six changes and they did pretty well. “We should mention Ben Dearsley who came in in goal. “He did ever so well. He had a great game and then made three saves in the penalty shoot-out so I’m chuffed to bits for him. “Now we go on again and have another tough test at Newport Pagnell. “They are a similar side to Deeping so we know what to expect.